A psychedelic puzzle-platformer with a beat to move your feet. Octahedron gets more mileage than you'd think out of the ability to summon platforms beneath your feet. What is it? A punishing yet rewarding rhythm platformer about a bloke with a weirdly shaped head. The screen shakes. I jump and create a platform below me. It sticks to my feet, so I run to the side, using it to block enemy attacks from below, and then slide under an incoming laser. Phew, that was close. Octahedron sets you at the bottom of vertical levels you have to climb in time with throbbing electronic beats. Rather than just being a gimmick, the act of creating platforms is looped into pretty much everything you do, tying into both your movement and your attacks. It is clever, extremely intuitive, and most importantly fun to experiment with. It helps that Octahedron's electronic soundtrack is absolutely amazing. It's full of gorgeous synth melodies and pounding basslines to keep you energized, and ramps up the tension tremendously on each subsequent stage. The soundtrack includes contributions from genre veteran and lead developer Marco 'Monomirror' Guardia (formerly of the group Flutlicht), Niamh 'Chipzel' Houston, and producers André Sobota and Derek Howell, and their combined experience shows in the quality of the finished work. Music isn't superfluous to Octahedron. Every track has a different bpm and a beat that matches the timing of the obstacles in each stage. This is not unique—the indie platformer Ersatz and Simogo's Beat Sneak Bandit did this in the past, for example—but it is something I've always adored for the way it fits a natural learning curve. I often revisited older stages and found that I could complete them with much more ease the second and third time around, with the game rewarding me for having learned its soundtrack and picked up the tempo. I also enjoyed the central mechanic of making your own platforms. On each stage, you can create a small number of temporary platforms to climb with, which appear directly beneath your feet. You can renew the number of platforms you can make at any time by stepping back onto solid ground, and can use them not only to ascend up through a level, but also to block incoming attacks and smash lights to earn collectibles. You create elevators by making platforms in empty silhouettes found throughout levels, and destroy chains holding up blocks to change the level geometry. Later stages bring new platforms too, which are equally fun and simple to use. Early on, I unlocked a platform that shot a downwards blast, destroying some of the peskier enemies. There was also an elastic platform that sent me soaring way up into the air to skip parts of the stage. What's great is that Octahedron gives you time to get used to these new additions, ramping up the intensity of stages gradually and letting you experiment before the difficulty peaks. It never rushes you and is fantastically paced all around, giving you the opportunity to be playful before you enter the hellish high-intensity areas and letting you grow accustomed to your new abilities so that they become second nature. It does have problems, though. One is readability. 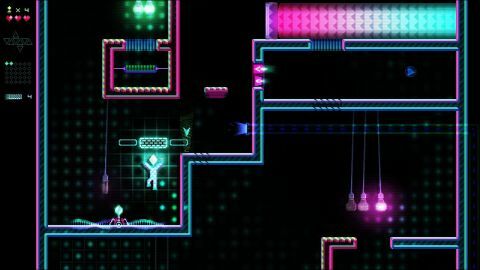 Octahedron, especially in the later stages, throws a lot on the screen at once, an issue that is exaggerated by the way so much of it draws from the same neon color palette. I had moments where I would dodge one attack only for a bunch of enemies to suddenly appear out of the screen noise and overwhelm me. The placement of checkpoints didn't help either, punishing me whenever this happened by sending me back to a much earlier position. Things like this make the busier stages a slog to get through, at least on the first playthrough. There is also the tonal whiplash of the cutscenes that tell Octahedron's minimalist story. The game is bookended by two dour animations that, although nice to look at, feel entirely out of sync with the bouncy and energetic style. Octahedron does a good enough job telling a story without them that they felt redundant and confused me with their dramatic shift in tone. Still, Octahedron is a great platformer. Though I did have some issues with the presentation, the checkpointing, and the sometimes crushing difficulty of later levels, that never dampened the joy I felt in those precious moments when I finally clicked with a stage I'd been struggling with for hours and made it safely to the exit.